Because "the act of reading is not natural" in the sense of "genetically organized," the brain must "rearrange itself" to do so, a process Wolf explains on a neuronal level. Reading is an unnatural act, claims Tufts psychologist Maryanne Wolf. So why don't police officers hide in public restroom stalls, waiting to pounce at the first rustle of page-turning next door? Simple answer: Reading, to educated types, is an unnatural act next to godliness, a blessing to be encouraged in children, applauded in adults and sacralized by teachers. That dual profile -- unnatural yet wonderful -- provides the parameters for Wolf's brilliant and eye-opening, but also occasionally exasperating, Proust and the Squid. Titled for a certain French novelist whose leisurely, snob-appeal sentences require close attention, and a slippery creature that scientists of the 1950s preferred to neuronally test rather than eat, it's Wolf's trade-book extrapolation from her core research on dyslexia. The plot? How our brains manage the fantastic feat of reading, still unmatched by dolphins, baboons and other faddish semi-humans. On the plus side, Wolf, director of her university's Center for Reading and Language Research, knows everything scientific and social-sciencey about how children learn, or fail to learn, to read. Without moving her lips, she relates here what our brains do while we're reading and what they look like in imaging technology. Wolf acknowledges from the outset that her book is "more biological and cognitive than cultural-historical." Yet, like many scientists in books aimed at a popular audience, she exudes such true-believer excitement about her research that she often exhibits a deaf ear to how empty some of the findings are for nonclinical or medical purposes, how they tell us no more than what we already knew from the humanistic tradition ("Human brains can read, somehow"), albeit in duller language. Wolf begins in Paul Revere mode by warning that reading could be a skill that will deteriorate in a future digitally obsessed age. There has been no time, she writes, "when the complex beauty of the reading process stood more revealed, when the magnitude of its contributions was more clearly understood by science, or when these contributions seemed more in danger of being replaced by new forms of communication." Because "the act of reading is not natural" in the sense of "genetically organized," the brain must "rearrange itself" to do so, a process Wolf explains on a neuronal level as she explicates the "plasticity at the heart of the brain's design." She reminds us that our ancestors invented reading only a few thousand years ago and that the advanced brains of expert readers today would not resemble those of Sumerians who deciphered cuneiform script, because complex and challenging reading changes the brain physiologically. That is why we must teach children to read, while we do not need to teach them vision or speech (as opposed to how to see well and speak well). Some of this material engages. It is fascinating to learn that "a person who learns to read in Chinese uses a very particular set of neuronal connections that differ in significant ways from the pathways used in reading English." Similarly, that the Greek alphabet changed the actual way we think will enlighten those who didn't hear it from classicist Eric Havelock long ago. Unfortunately, Wolf's endless statements about the brain's circuits and pathways and structures and connections and associations only confirm that ordinary English lacks terms concrete enough to make prose description of the physiological brain sufficiently lively to keep the general reader's brain awake. It doesn't help that Wolf's cultural summaries of subjects like Sumerian and Akkadian writing, and her occasional analyses of literary sorts such as George Eliot and Dostoevsky, come in merely serviceable rather than spiffy sentences. Even when she's dealing with a species that sounds as if it could hold one's attention -- e.g., Nigerian putty-nosed monkeys -- she tells us nothing about them. Compare, for instance, a line she quotes from the practiced science popularizer (and top linguist) Steven Pinker: "Children are wired for sound, but print is an optional accessory that must be painstakingly bolted on." Finally, Wolf tests one's confidence when she makes scientistic claims considered laughable by sophisticated humanists. She asserts, for instance, that when you've read the "233 words" in one passage of Proust, "your word meaning, or semantic, systems contributed every possible meaning of each word you read and incorporated the exact correct meaning for each word in its context." But there is no such thing as "every possible meaning of each word you read," or an "exact correct meaning for each word in its context." Actual language remains too fluid and free for that, except in the "controlled" experiments of scientists and linguists. Thankfully. 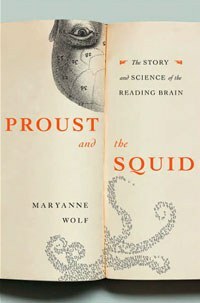 Proust and the Squid much improves in its third and last section on Wolf's core area of expertise -- dyslexia -- which occupies her as both researcher and mother of a dyslexic child. Here, moving between examples of dyslexic high-achievers from Leonardo da Vinci (presumed from the many mistakes in his notes) to driver Jackie Stewart, she illuminates the subject and warns that we should stop offering "a one-dimensional account of reading disabilities," which are more complex than that. Through all this, Wolf provides daunting down-to-earth facts to think about in regard to the teaching of reading. In some environments, she reports, "the average young middle-class child hears 32 million more spoken words than the young underprivileged child by age 5." If this book contains any one powerful lesson for parents from the field of "reading" science, it's the extraordinary importance of regular reading to and talking to one's children when they are young. Writes Wolf, "Children who never have a story read to them, who never hear words that rhyme, who never imagine fighting with dragons or marrying a prince, have the odds overwhelmingly against them." For a book about reading, Proust and the Squid is hard to read. Of course, Wolf may just be testing us.